Most anyone with fifty-plus years of experience in their professional field is likely on the verge of retirement, if not retired already. 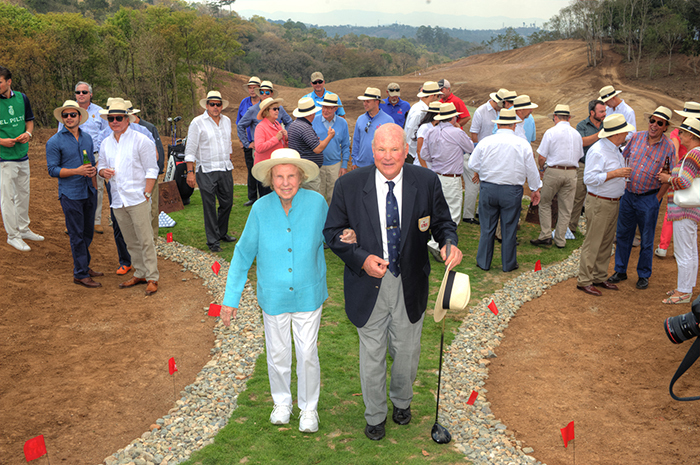 Not so for acclaimed golf course architect Perry Dye, the first-born son of World Golf Hall of Fame member Pete Dye. Golf course design was dinner table conversation in the Dye household, and Perry was under his parent's tutelage as an adolescent, and working on site as a teenager. "The first golf course I ever worked on was Crooked Stick," begins the sixty-something Dye, referring to the site of numerous USGA Championships and the 1991 PGA Championship, a fixture on various "Top 100" course lists. "Talk about jumping into the profession feet first, and learning right from the beginning how to construct a world class course. I guess I should be thankful for the time the babysitter never showed up, they were forced to bring me to the job site, I made myself useful, and my education began!" Other marquee courses where Perry learned the trade include The Golf Club in Columbus, Ohio, Oklahoma's Oak Tree, and Teeth of the Dog in the Dominican Republic. Like the aforementioned Crooked Stick, each course has or continues to occupy various "Top 100" lists. Over the decades Perry Dye has not only been an integral part of Pete and Alice Dye's design team, part of the inner circle and 'brain trust,' but he's also gone on to great acclaim with dozens of solo projects around the world. Starting in Colorado, where he's made his home for many years, Perry Dye 's earliest creations include TPC Plum Creek, Riverdale Dunes and Glenmoor Country Club, all located in the Denver suburbs. The latter in particular helped initiate his reputation as a 'green' builder, long before environmental issues came to the forefront of golf design. The small footprint of the course resulted in lower water, maintenance, pesticide and fertilizer usage. Integrated storm water systems, buffer strips, native and drought-tolerant grasses have become staples of most every Perry Dye design. This is a practice he's emphasized as he began building dozens of acclaimed courses through the western United States, in Europe, the Far East and throughout Latin America. "May you live in interesting times" is a well-known Chinese quotation, and relevant to Perry Dye well beyond the fact he's built courses not only in China, and Turkey but extensively in Japan, Thailand and Korea, among other far-flung locales. Dye's career has coincided with the biggest boom in the history of golf, from the mid 1960s until the early 2000s, and then the most precipitous drop in the game's popularity, from the early 2000s until now, with millions of players abandoning the game and thousands of course closures. "I've seen the business at its highest point, at the current low point, and everything in between," continues Dye, a longtime member of the American Society of Golf Course Architects. "Fifteen or twenty years ago, there were three hundred or more new courses opening annually. Now it's literally just a handful. It's a testament to our experience and reputation, the work we do and continue to do, that we've stayed busy despite the fact that business has been reduced worldwide by ninety percent or more since its apex." Just like his parents, Pete and Alice, who started to do some of their finest work in their fifties, sixties and beyond, Perry Dye is following a similar trajectory. "I feel it's an accumulation of experience, knowledge, wisdom, and exposure to different cultures. 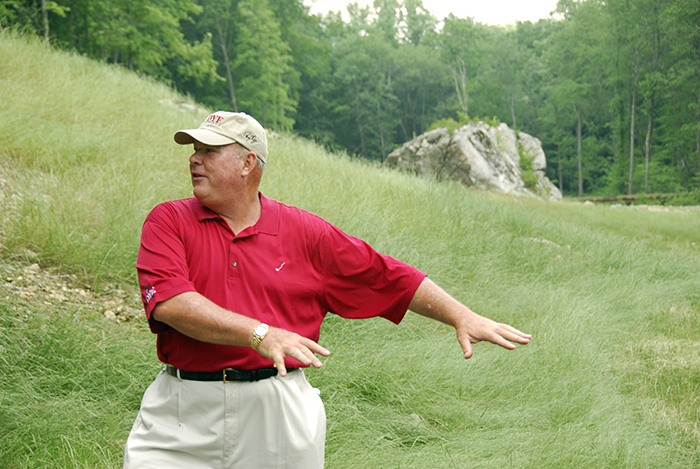 It's being on site for weeks at a time in a variety of different terrains and topographies, working with a wide range of individuals, both at home and overseas, that have allowed me to improve and sharpen my work," continues the longtime member of the Golf Course Builders Association of America. The father of two and grandfather of two theorizes the technology boom hasn't just benefited players, but also course designers. Golfers have embraced graphite shafts, perimeter-weighted irons, clubs and balls made of various polymers and other space-age materials. However similar advances have allowed architects to flourish, building courses more efficiently and capably. Advances in irrigation, earth-moving and shaping equipment, mowers, fertilization and new strains of turf grass have all made the building process more streamlined, which results in higher quality courses built less expensively and in a timely fashion. Over the decades and on hundreds of job sites, Perry Dye has by turn assumed the mantle of architect, engineer, site manager, builder, shaper, and many other roles that make him in essence, a one-stop shop. Particularly in the contracting golf economy, it's far more affordable to have just a few people running a project than a whole contingent. It makes more sense to have one experienced person than a team of ten. Dye's international experience affords a perspective that many architectural colleagues simply don't have. "The heavy equipment we have at our disposal in the States either doesn't exist in other parts of the world, or is prohibitively expensive to get to the building site. If you need specialty equipment in the U.S, it's usually either down the street or in the next zip code. This is rarely the case elsewhere. What these foreign countries do have is manpower, so we've learned to improvise, using manual labor to construct courses where large-scale equipment isn't available." Despite the hundreds of projects undertaken, the millions of rounds played on his courses, the multiple millions of air miles flown, and the awards and accolades received by his courses in Turkey, Honduras, Guatemala, and other dots on the map, Perry Dye isn't finished yet. "My parents are still working and creating at age ninety," concludes their eldest child, incredulously. "I'm not sure I'll be working for twenty-five more years, but I love what I do, my clients and their patrons are happy with the end result, so another decade or more is definitely in the cards."